My giveaway has ended! Thanks to the 46 people who entered to win some Jewish snacks. I wish *I* were winning Jewish snacks. Then again, I work with Jews. And we snack every day... so I guess I'll be Jewish snacking tomorrow, as usual. Anyway, the giveaway went down like this. 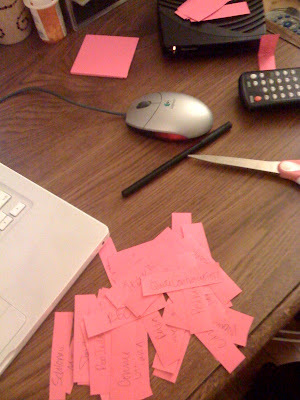 Very exciting: First, I wrote on little slips of paper. 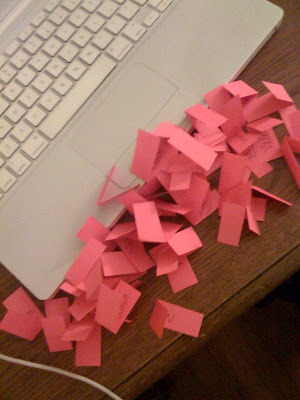 Chopped up Post-Its, actually. I keep it classy. Don't worry, I tossed the sticky parts. And boom! We've got a winner! 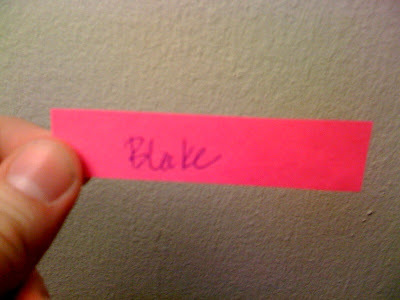 I feel marginally guilty that one of my good friends won my giveaway, but it was fair & square! So CONGRATS, my dear! The winner shall be contacted a.s.a.p. via text message, which is our primary form of communication. Thanks to all who participated - & even if you didn't win, I encourage you to buy your Purim goodies from Oh!Nuts. And now - back to your regularly schedule Suburban Sweetheart broadcast.